The greatest week in sports is upon us once again and everyone still has a chance to fill out the perfect bracket. 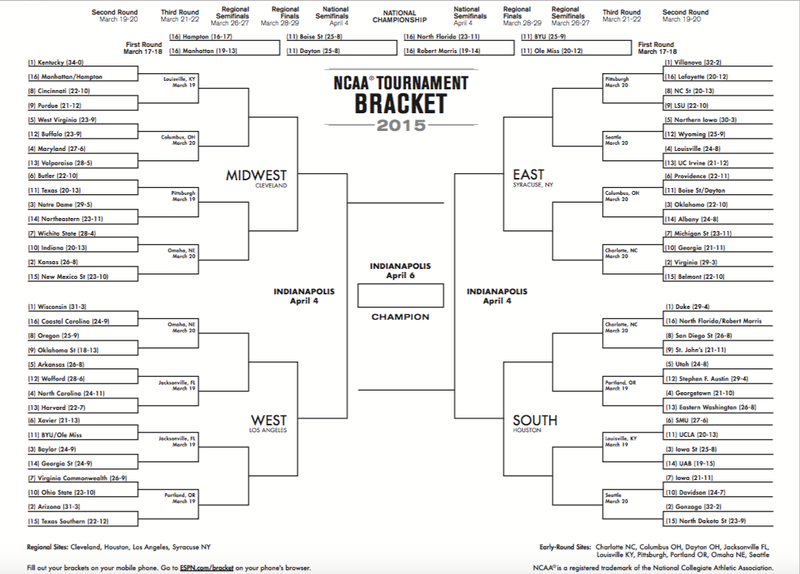 I couldn’t even imagine guessing every game in a 64-team one-and-done tournament correctly, but every year people obsess over trying to predict who will win the National Championship. While the madness does not start until Thursday at noon, trying to figure out which upsets to pick can drive you mad in the days leading up the tournament. I far from know it all, but I know one thing: history tends to repeat itself. Here are some historical statistics that the Zoc-etologist believes will help determine which upsets could happen in the second (or first) round. Most of the stats I am about to talk about are from ESPN’s “Seed Fact” in their Tournament Challenge. Everyone worries about those 12 vs. 5 matchups (I’ll get to those in a little while), but if your going to pick an upset let’s get serious. This almost guarantees one 2-seed is not going to make it to the second weekend of the tournament. I think the teams to watch out for this year are Kansas and Virginia. The Jayhawks have a history of losing early in the tournament (last year to 10-seed Stanford) and this year’s team is not as good as last year’s team was. I think their potential matchup with Wichita State in the third (or second) round could spell big trouble for Kansas. Virginia is a team that I really respect. They play some serious defense, but struggle to score at times. One of their leading scorers is just coming back from injury and was not himself in the ACC Tournament. Again, its all about matches and the Cavaliers cannot be thrilled about potentially seeing Michigan State in the Round of 32. Don’t forget the Spartans knocked off the Cavaliers in the Sweet 16 last year. Last year was the first time since 2007 that a 13-seed failed to beat a 4-seed. Never before have 13-seeds gone winless in consecutive tournaments. History is just screaming THIS IS GOING TO HAPPEN THIS YEAR! The question, as always, is who will be upset. I listed the potential upsets above in the order I think they are most likely to happen. Georgetown has found a way to lost to significantly lower seeds in something like three of the past four times they were in the tournament, most recently in 2013 to Dunk City. (Just took a moment to watch that video of Florida Gulf Coast… Wow.) Eastern Washington has the nation’s leading scorer in Tyler Harvey. That is about all I know about them, but I do know all it takes is one player getting hot for an upset to happen. I really like this Maryland team lead by Dez Wells, so I am hoping they don’t get upset. Valpo is a team that really rebounds well, and that is something that usually travels well come tournament time. UC Irvine has been talked about for their biggest player, 7-foot-6 Mamadou Ndiaye, and that alone gives them a chance to beat anyone. Louisville is a good team that has been inconsistent this year and that always scares me, especially when they facing a team that is know for making threes. No. 6 seeds have won 66 percent of the time against 11-seeds, but have split the last 20 meetings dating back to 2010. I combined two stats in this one because both of the “First Four” at-large winners will be in the 11 vs. 6 matchup in the Round of 64. Everyone likes Texas to beat Butler, but I am not as sold. Texas has been really inconsistent this year, mainly because of how banged up their team has been. The Longhorns are healthy now, but I personally don’t trust them. Either team that faces Xavier has a really good chance of moving on in my opinion, especially if its BYU. The Cougars are lead by triple-double machine Kyle Collinsworth and they have been a very solid team all year. Does Dayton as an 11-seed sound familiar to anyone? They were the same seed last year and surprised a lot of people when they advanced all the way to the Elite 8. I expect them to win at home in their “First Four” game and then continue on to beat Providence. The Friars’ team this year is better than last year’s team, who lost in the first round to North Carolina, but I would pay extra close attention to this matchup if Dayton advances. I know one thing for sure: One of the at-large teams that win on Tuesday or Wednesday will continue their success into the next round. Only three times in the pat 30 years have No. 5 seeds won all four meetings with No. 12 seeds (It last happened in 2007). No. 12 seeds are 3-1 in each of the past two NCAA Tournaments. Let me start with the two 12 vs. 5 matchups that I did not mention. I really like Northern Iowa. Let me say that again: I really like Northern Iowa. They are a really good “team” that plays together and runs their offense from the inside out through do-it-all player Seth Tuttle. I like Arkansas as well, but that matchup is more about me not liking this year’s Wofford team who I believe is not as good as they have been in past years. The only 12 vs. 5 upset that I may actually end up picking is Buffalo over West Virginia. The Mountaineers are banged up, and are playing a team that has three really good guards in Buffalo. The Bulls are also really well coached by former Duke guard Bobby Hurley, which also always helps. I believe West Virginia’s pressure will not be as effective as they would like it to be and they ultimately struggle to score, opening the door for Buffalo to win the game. Everyone also likes to talk about Stephen F. Austin upsetting a team for the second year in a row. I think SFA has a good chance to beat Utah, but I just want people to remember they needed a 4-point play at the end of regulation to beat VCU last year. Utah is a good team lead by big man Jakob Poeltl. That is one of the harder second (or first) round games for me to pick this year. Hope this helps when trying to decide which upsets to actually pick. Just remember: History tends to repeat itself! My picks will be up tomorrow at some point, and they will be explained on a March Madness podcast that will also be posted tomorrow. Stay tuned for that stuff and happy bracketing. This entry was posted in Home, March Madness 2015, NCAA and tagged 2015 NCAA Tournament, bracketology, History, March Madness, NCAA Tournament, Zocetology. Bookmark the permalink.